Volkswagen's Electric Car is coming for 2020. 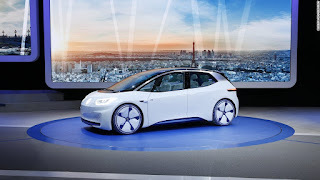 Volkswagen's company showed a prototype in paris Motor's Show which was held few day's back to show some key facts. This Electric car is specially designed with 125K Electric Motor with zero emissions. Volkswagen's Electric car is based on Modular Electric Drive architecture company for the first time ever. This Company say that Electric car covers range of 600 Kilometers.